Traditionally made with leftovers, this dish is definitely tasty enough to justify the efforrt of whipping up a fresh batch of mash. Instead of dusting with flour, I used polenta instead so that it adds a crunch to the cakes. Makes about 6 - 8 cakes. 1. 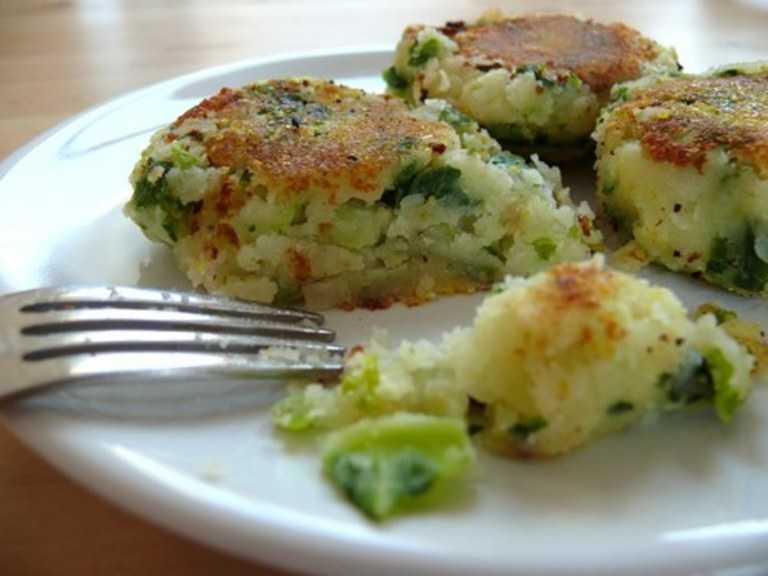 Peel potatoes and cut into fairly large chunks. Add to a pan of salted boiling water and cook until soft. Drain well. 2. Add leaves to another pan of salted boiling water and cook until soft, but not mushy. Drain well and chop into small piece. 3. Add butter to potatoes and mash until smooth. Stir in cabbage, salt and black pepper. 4. Shape into flat rounds and dust lightly with polenta or cornmeal. Sit on a tray and put in a fridge for around 30 minutes. 5. Heat oil in a small pan and add cakes. Cook one side until brown (I like to press them with the frying slice so the edges go craggy and crisp) then flip over to cook the other side. Ready to eat.